This Sunday , on an autumn morning Berlin , Wilson Kipsang ( 15/03/1982 ) again has managed to lower the world record marathon ( sixth time since starting occurs century) , and has made good theories that Berlin confirms part ( again) as the perfect marathon for a challenge of this magnitude , and on the other hand, you confirm Kipsang himself as the fastest runner and more regular so far in the distance. On the one hand , Berlin is now the scenario that have beaten the last five records (from Tergat , two of Haile , the Makau and yesterday Kipsang ) , and race , in its 40th edition , boasted of this fame that year after year is becoming the reference marathon , so to celebrate the anniversary, the organization has collected over the weekend next to the Brandenburg Gate to the seven runners in the men and women who had previously beaten the world record ( eight times ) in the German capital , and now you have to add to Kipsang Wilson (Patrick Makau 2h03 : 38; Haile Gebrselassie 2h03 : 59 and 2h04 : 26 , Paul Tergat 2h04 : 55; Ronaldo da Costa 2h06 : 05; Naoko Takahashi 2h19 : 46; Tegla Laroupe 2h20 : 43 and 2h34 Vahlensieck Christa : 48 ) . Moreover, Wilson Kipsang , beating the old record by Patrick Makau in 15 seconds , it becomes the fastest runner in history with 2h03 : 23 according to the IAAF criteria ( which exclude 2h03 : 02 Geoffrey Mutai in Boston given the cumulative drop test ) , and we can also say that becomes more regular , because after Sunday's race , with four times, is the man who has dropped more times 2h05 : 00 ( 2h03 : 23 Berlin 2013 ; 2h : 03:42 in Frankfurt 2011 , 2h04 : 44 in London 2012 and 2h : 04:57 in Frankfurt 2010 ), beating Haile Gebrselassie , who has achieved three times , and also becoming the first man dropped twice in 2h04 : 00 . Wilson Kipsang had warmed the atmosphere in the weeks before , and never hid his intentions to attack the world record . Following the presentation of the runners who would be in Berlin, immediately set out to announce that run under 2h03 : 00 was possible, and he was sure that in the German capital Patrick Makau or he could get . Then, after the announcement of the withdrawal of the injured Makau , reemphasized that if conditions were optimal , he was ready to beat the world best . 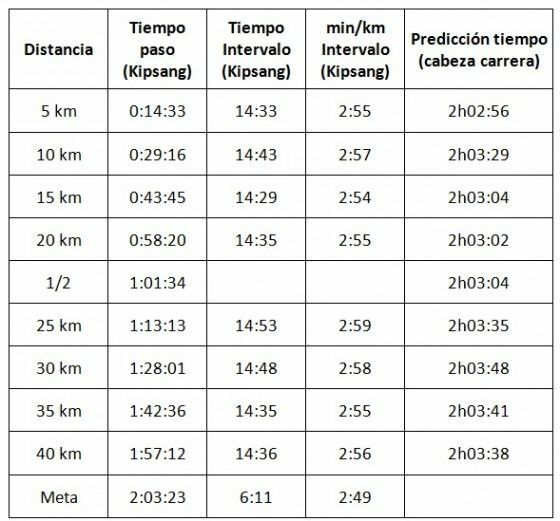 The race started with the planned work of the hare, and the first partial cautious optimism invited , and that all references in five kilometers cast a world record at the end of the test to get maintain that pace , so that as see in the table below add , and as we say , always partial record below half of the race, Wilson Kipsang reached the half marathon in 61:34 , which projected a time of 2h03 : 04 for the final race (taking the first time this happened leading group by the mean) . The pace that was put in this first part of the race was optimal , and while it was fast enough to be able to beat the world record, it was not a suicide announced making it impossible to run the second part guarantees . Hares did their work , and a large group in the lead was another factor in favor of intentions. In this way , it was the half marathon in the same vein as in the rest of partial start of the race over the current record with nine seconds below the record day of Patrick Makau in 2011 ( 61:43 ) and with 29 seconds to advance while registered in 2008 in the previous record of Haile Gebrselassie ( 62:03 ) . Perfect situation , but remained to be seen if the truly decisive in the race, the trio of Wilson Kipsang , Eliud Kipchoge and Geoffrey Kipsang would be able to keep up , and get the second half marathon in less than 62 minutes to achieve longed record . Kipsang , intelligent , secure in the central part of the group, left to do , and hares continued their work, expected to thirty kilometer . However, here began the wall of this race , and rhythm, which fell to the partial 2:59 mile 20 to 25 , and 2:58 in the partial 25-30 ( the two sets of the race slower ) , began creating doubts whether we were really able to see a new world record. However , it was the thirty mile with a time of 1h28 : 01, 23 seconds worse than the day of the record of Patrick Makau , that while it was true that he then made his worst partial (especially in the 35 to 40 kilometers ) , the worst news was that the projection was in 2h03 : 48, for the first time all over the current race record , and especially at a point where it seemed that the famous wall made ​​its appearance , and from which no would hare . The marathon gives nothing . Here you can not go all the time drifting pace . The decisive moment when the brave, had arrived. And the challenge was not small . Philemon Rono was the last hare, and managed to stay until mile 31. From that point , they could only be the elect, and Wilson Kipsang , far from cowering , started a real concert that will take a long time to forget. 2:55 cruise Rhythms in partial kilometer 30 to 35 ( where it was still 20 seconds behind Makau , but since only 3 seconds of the record in the projection ) , and 2:56 in part from 35 to 40 ( reached where Makau just three seconds after ten kilometers fantastic, and with a projection that equaled the existing world record). Geoffrey Kipsang was the first of the trio of favorite stay, and Eliud Kipchoge , fantastic, although sometimes stay and appear to engage with Wilson again Kipsang , could not hold the very strong pace that led to this point in career ( Kipchoge nevertheless ended in 2h04 : 05 his second marathon, which makes him the fourth man in the history of the IAAF rankings ) . Kipchoge pressure certainly served to spur more Kipsang Wilson , and thus arrived at kilometer 40 with all options on high, with more emotion impossible. From that point, along with the show, and just flew Kipsang . He finished the last 2195 meters in 6:11 (12 seconds faster than Makau in this interval , 14 seconds faster than the legendary Haile Gebrselassie ) , which is a part of something more than two miles to finish an official 2:49 marathon. Informally, the last ten miles were covered in 28:52 . Officially, the second half-marathon , Wilson Kipsang covered it in 61:49 , which added to the first part of 61:34 , gives a new world record in 2h03 : 23. 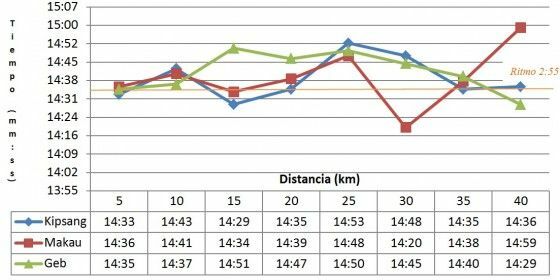 As we have been discussing , comparisons with previous records of Patrick Makau and Gebrselassie Haile best seen graphically , we can deduce how Kipsang made ​​a run at a very regular basis, with several partial nailing 14:35 corresponding to the 2:55 min / km required ( orange trace line fixed 2:55 pace ) , and minor variations and a Makau constant pace (who came to run the 25-30 at 14:20 , but that covered the 35 to 40 in 14:59 ( Kipsang not cover any or as fast or as slow) , and Haile Gebrselassie himself , who from kilometer 10 to 30 accumulated four sets around 14.50, which ultimately will penalize Kipsang compared and Makau . MY PUBLIC THANKS TO MIGUEL CALVO FOR LET ME USE HIS ORIGINAL ANALYSIS IN SPANISH ON MY BLOG!!!! HERE THE ORIGINAL !!! !